Edward Gorey is the master of all things dark and wonderful. Gorey wrote and illustrated over 100 books and he became king of macabre. His books were beautiful and sometimes oddly touching. He is most known for The Adams Family which has been remade again and again as a TV series and as several movies. My favorite of his books was The Gashleycrumb Tinies. For years, I sent out Edward Gorey Christmas cards and as I mailed my cards yesterday I had to admit I miss my dark Christmas theme. I did not use my Gorey cards this year because I ran out of time and didn't plan far enough in advance. I know, big surprise. But I thought in lieu of my cards, I would do a post on some of the most marvelous and ghostly Christmas cards ever made. 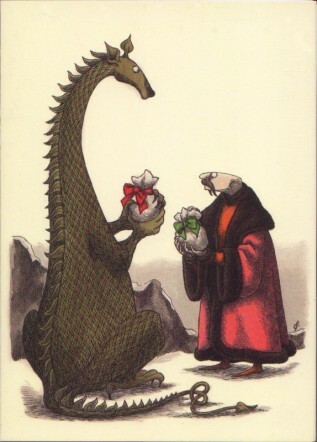 Gorey did numerous Christmas cards and Christmas illustrations in his career. These are only a few, but they are all marvelous. I love, love, love the Gashley Crumb tinies. My BFF and I share a dark sense of humor and I couldn't wait to send him a copy when I discovered it way back when ... because the only thing better than dark humor is someone to share it with (someone who really gets it). I also love Goreys graphic, etching/pen & ink style. I have sent the fruit cake card myself ... before I had kids and started doing photo cards. I really like the illustration with the dragon at the top of your post. OMG! Wonderful! I didn't know he made Christmas cards, nor did I know his Addams Family connection. Learned something new! I'm going to have to find me some of these for next year! 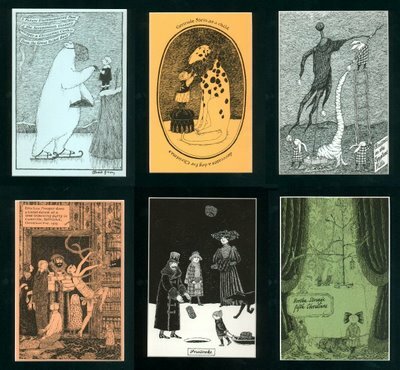 I really like Gorey's cards. I never knew the Addams Family connection either. Charles Addams created the Addams Family.